For the first time in Boston, the “most beautiful drawing in the world” and a recently discovered self-portrait of Leonardo da Vinci (1452-1519) will be displayed. Presented at the Museum of Fine Arts, Boston (MFA), from April 15—June 14, 2015, Leonardo da Vinci and the Idea of Beauty features a number of highly admired drawings by Leonardo. The exhibition, organized by the Muscarelle Museum of Art, explores the artist’s concept of ideal beauty through 30 drawings and manuscripts by Leonardo, Michelangelo and their followers. Because he left so few paintings, Leonardo’s drawings have been recognized for centuries as the deepest window into the workings of his mind. has been considered by some to be the “most beautiful drawing in the world,” bringing together his ideal of beauty and convincing naturalism to an astonishing degree. a newly discovered self-portrait. Identified five years ago, the partially hidden portrait depicts the artist at age 50. Works on view in the exhibition include a rich and varied selection of loans from Italy—primarily from the Uffizi Museum in Florence and the Biblioteca Reale. On view in the MFA’s Lois and Michael Torf Gallery, the exhibition also includes seven drawings by Michelangelo (1475–1564) and one from his studio, offering a unique opportunity to compare a series of these rivals’ drawings. Through the artists’ works, visitors can see how their ideals of beauty were often polarized, with Michelangelo more concerned with abstract, super-human ideals than the natural world that tantalized Leonardo. Leonardo’s works represent the culmination of the early Renaissance idea of beauty, and reflect his view that ideal beauty could be observed by study of the most perfect human features. He was the consummate “Renaissance Man,” the painter of the Mona Lisa as well as a scientist—designing flying machines and studying anatomy in intricate detail. Dedicated to Leonardo’s artistic style and philosophy, the exhibition is organized into sections focusing on the “Idea of Beauty”—including old age and youth; “Divine and Worldly Beauty;” and “Science and Anatomy.” Every decade in Leonardo’s career is represented, as well as his influence on his pupils—known as the Leonardeschi—and his greatest rival, Michelangelo. An Old Man and a Youth Facing One Another (about 1500–1505). 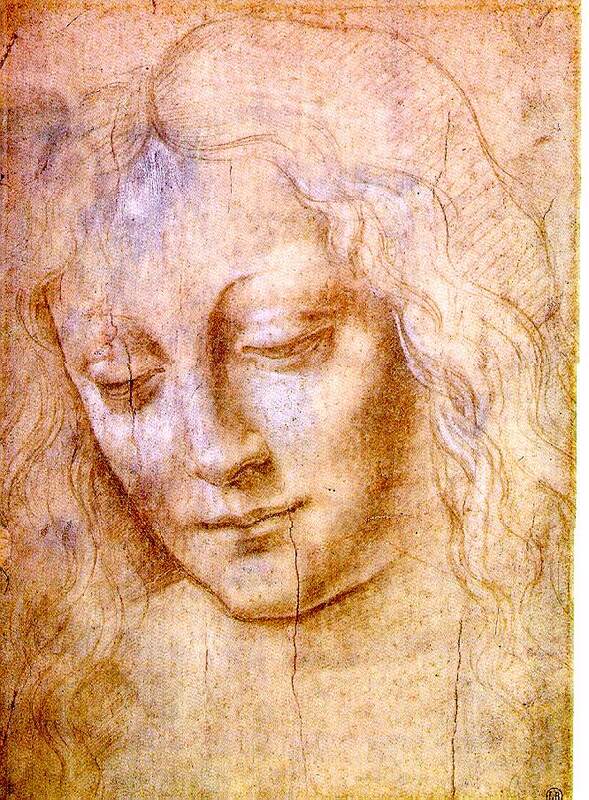 The young man may be based on Salai, a servant in the artist’s household who epitomized Leonardo’s notions of beauty. By contrast, the older man is a variation on an imagined warrior who appears often in the artist’s sketches. Working backward from old age to youth, the installation includes drawings by Leonardo and his assistants, as well as examples by Michelangelo and his studio. Two Drapery Studies executed at the very beginning of Leonardo’s career are a highlight of the section, and are among the artist’s greatest accomplishments. —representing a universally admired example of Leonardo’s ideal of feminine beauty. Another drawing, A Young Woman (1495–1500), was also once considered to be among Leonardo’s finest works. The exhibition offers an opportunity to rediscover this enchanting drawing, which in 1880 was one of only two chosen for illustration in a seminal book on the artist. More than a century later it is relatively little known. The section on “Divine and Worldly Beauty” encompasses a number of Leonardo’s depictions of angels, which appear both divine and earthly in the works on view. The final section, “Science and Anatomy,” includes the famed Codex on the Flight of Birds, which was recently found to contain a partially hidden self-portrait. The discovery was made in 2009 by a team of Italian journalists, imaging technicians and facial surgeons. 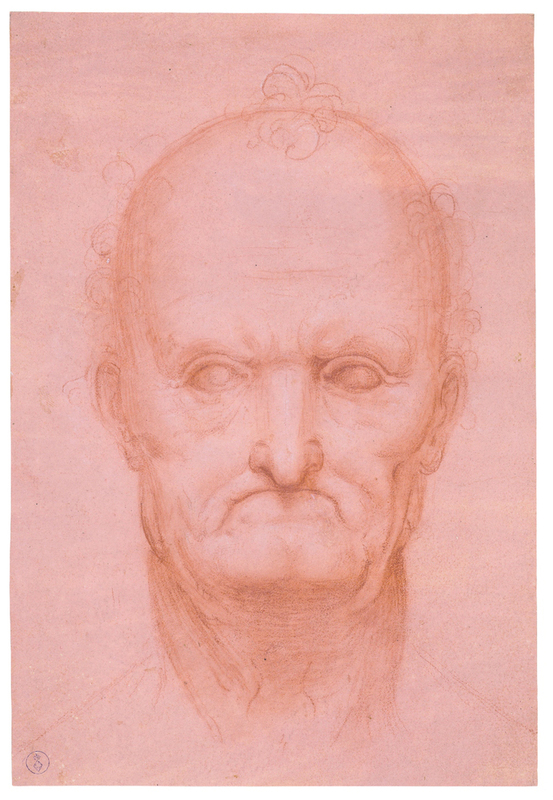 The face, isolated from the writing, is convincingly similar to a drawing in the collection of the Biblioteca Reale, long believed to represent the artist in distinguished old age. However, much debate surrounds Leonardo studies, and the team’s conclusion has been doubted by a number of scholars. Aside from the self-portrait, the codex itself is an extraordinary compilation of Leonardo’s sketches and thoughts on flight. The topics covered in the work include the aerodynamics of a bird’s ascent and descent, the fluidity of air as it moves over a wing, and the difference between the center of gravity and the center of pressure on the avian form. Displayed in a sealed case and open to the newly discovered self-portrait, the entire codex includes numerous sketches and drawings. Leonardo’s practice of drawing from life was on the cutting edge of scientific exploration in the Renaissance. Long fascinated by the “similarities of flight of birds, bats, fishes, animals, insects,” Leonardo’s scientific studies also include drawings of horses—animals Leonardo owned, rode, cared for, and sketched throughout his life—and insects. were drawn at different points in the artist’s life, but were mounted together on a single sheet by a collector, perhaps in homage to the extraordinary powers of observation captured by the small studies. Two of the prior owners of this drawing—one, Sir Joshua Reynolds, a well-known British artist—left their marks (identifiable stamps) on the sheet, a tradition in the ownership of Old Master drawings. Within the exhibition, drawings by Michelangelo and his studio—on loan from the Casa Buonarroti, his ancestral property in Florence—are displayed alongside Leonardo’s works. Both artists were fascinated by ideals of beauty, but looked to different sources for inspiration. Michelangelo more readily departed from nature and valued such incalculable qualities as gracefulness, power and drama as much as representation. 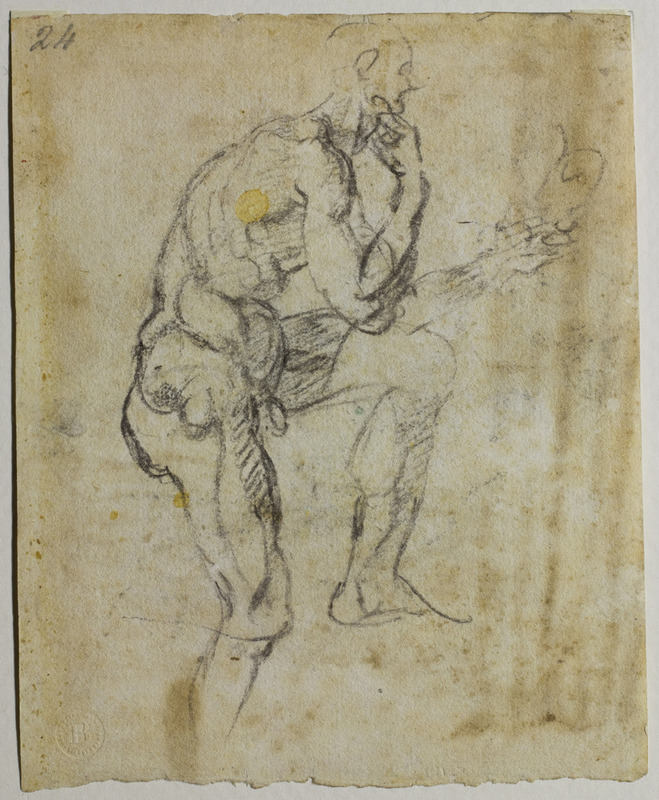 Michelangelo’s practice of borrowing and exchanging (and improving) conventional forms of anatomy was an integral part of his approach, unlike Leonardo’s closer fidelity to the original natural source. is an example of his relative freedom from anatomical exactness—a criterion that Leonardo never fully abandoned. The MFA previously displayed a number of the artist’s drawings in the exhibition Michelangelo: Sacred and Profane, Master Drawings from the Casa Buonarroti in 2013. Head of an Old Man (about 1515) could be attributed to Leonardo or Cesare da Sesto—one of the more original members of Leonardo’s circle in Milan. 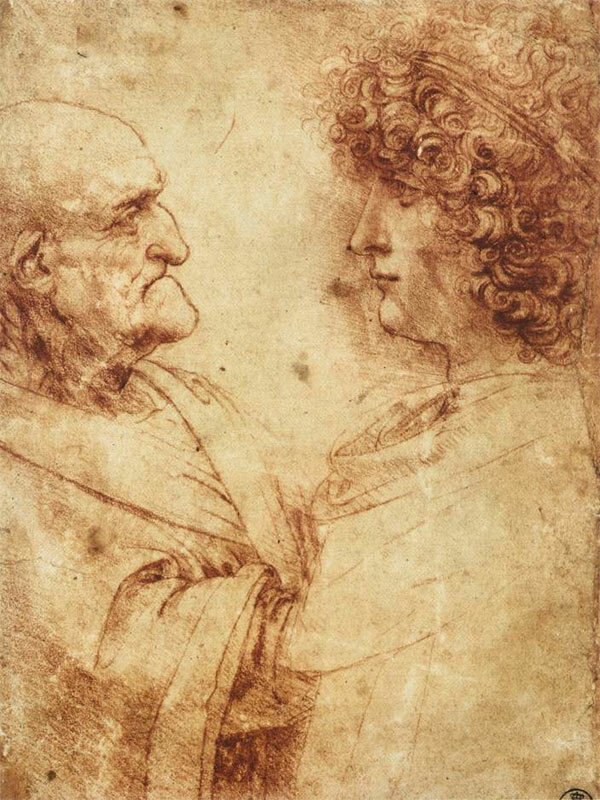 This work may belong to a group by Leonardo depicting a similar-looking elderly man at different stages of maturity, or it may be by Cesare, who executed many drawings and paintings based on Leonardo’s designs. This history explains some of the difficulty in differentiating Leonardo’s works from those of his followers. It also gives a sense of the group’s priorities—what they valued in the teachings of their master. Leonardo da Vinci and the Idea of Beauty invites visitors to try their hand at attribution, looking for characteristics such as Leonardo’s left-handedness in the works on view. and Aphrodite and the Gods of Love (2011).